Stay Charged On The GO! April Break for us means our annual trip to Boston for the best Marathon Monday ever! The husband, Mr. Running With The Girls, has run Boston for the past 5 years. Which means, that for the past 5 years, it's become our routine to head down to Boston for the expo, head to Ward and Wade's aunt and uncle's house for lots of family time, and then the Boston Marathon! I've spectated the Boston Marathon 4 out of those 5 years. The one year I didn't spectate, I actually ran it. Spectating the Boston Marathon is no joke! It seriously takes quite a bit of planning and organizing to get you through the day! One day, Ward will be the spectator and will completely appreciate all of the work that goes into spectating! By all means, I am not comparing the prep-work to spectating to the years of prep-work it takes to qualify for the race and then train for race day... or the hardwork of the fundraisers. Hats off to all of the Boston Marathoners - qualifiers, fundraisers, and invitational bibs! But I digress. Back to the spectating story. As I said, I've spectated that race 4 times. Each time is a little different and who is with me is a little different, but I've learned a few tricks along the way. Like keep my phone charged! First off, my phone is my freaking life source while spectating. If that battery dies, that I'd be lost. I need to keep it charged for several hours of heavy use! Thank goodness for the HubPlus and Style Power myCharge devices! Look at those marathoning twins! Love them! Before even heading down to Boston, I downloaded the BAA Marathon app, which allows you to track up to 10 different runners, get updates on the top runners, and see the map of the course. Which is super helpful if you're looking for a T station along the route! Another app that was super helpful was the MBTA commuter line app. It allowed my sister-in-law and I to pay for our tickets on the way in without having to worry about having cash on us. It also gave us the purple line incoming and departure schedules so we could make sure we made it back to Back Bay in time to make the outgoing trip back to Grafton and not have to wait another hour or so. of my favorite ladies - Melissa (center) and Amy (far right). and Amy actually lives closer to me...and is Izzy's teacher! But with all of that app usage, my iPhone battery dies super fast. Then add in the texting updates, phone calls, photos, Facebook posts. You name it! It's a crazy day. Like I said, I am so appreciative of my two new myCharge units. Yes. I brought both with me! Because of the fabulous myCharge, my phone (as well as a few other people's phones) stayed charged all day long! But my charging story doesn't end there! myCharge kept me charged the next day when we took the family into Faneuil Hall. I tucked my HubPlus into my bag and my phone stayed charged all day. The performance of the HubPlus and Style Power while in Boston made me a true believer. I keep one or the other in my bag at all times now, because you never know when you'll need one! but you get the idea. Super easy and convenient. The other day, at track practice, my phone completely died. I need it charged just in case a parent needs to get in contact with me or an athlete needs to get in touch with a parent. Thankfully I had my Style Power with me, and I was able to just plug in my dead phone and all was right with the world again. The Style Power. It's sleek and slim and perfect for the fashionista to stay charged all day long, anywhere you go! It has an integrated USB charging cable and can be used about 500 times. It is a 2000mAh power, that gives you up to 15 extra hours of talk time on smart phones. It's a great deal at $19.99. Check out the other styles available. Both myCharge devices charge so easily! All you need to add to the Style Power is a USB plug. We have tons around out house and they are super easy to pick up just about anywhere! The HubPlus has a plug built into the back side that just flips up whenever you need to charge! And it comes equiped with two different an Apple® Lightning™ cable and an integrated micro-USB cable, to make your charging needs effortless. This power bank packs 6000mAh, has been newly designed to be 30% smaller in size and extends talk time by 45 hours! The retail price of the HubPlus is $99.99 and is completely worth every cent. Now, onto the the best part! 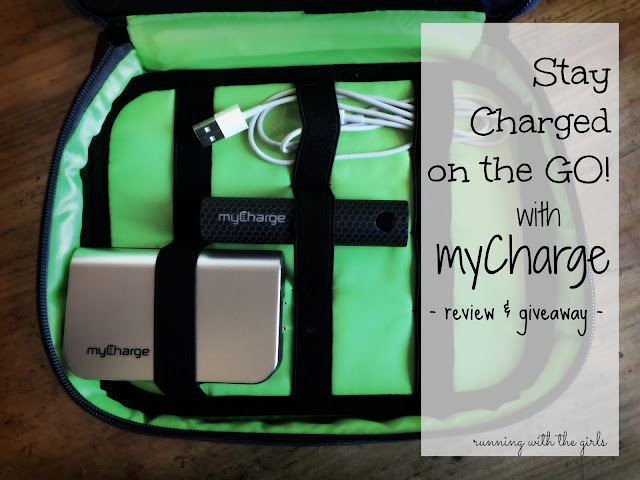 Now that I have you excited about myCharge and their fabulous products, I get to share a discount code with you so you can stay charged all of the time - on the go - with everything you do! Use congrats for 40% off the HubPlus. That's an amazing deal!!! Code is expires 5/31/16. Actually, now that marathon training officially begins next month (gulp).... I will definitely be tucking my Style Power in my backpack while I run so I can stay charged while literally, on-the-go! And if you are feeling lucky, myCharge has offered TWO of my readers their own myCharge. I have ONE Style Power and ONE HubPlus to giveaway. myCharge contest will run from 4/28/2016 to 5/8/2016 (midnight, EST). 2 winners will be selected using rafflecopter. 1 winner for the Style Power, 1 winner for the HubPlus. Prize package will be mailed out by myCharge. This post is sponsored by myCharge who understands that this review and the opinion stated is that of my own. As always, all opinions expressed in my blog are 100% my own.